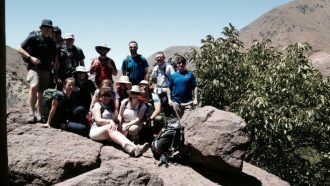 Our High Atlas and Mount Toubkal walking holiday in Morocco combines the challenge of summitting Mount Toubkal, North Africa’s highest peak (4,167 m), with some moderate walking in the High Atlas Mountains and the vibes of exotic Marrakech. 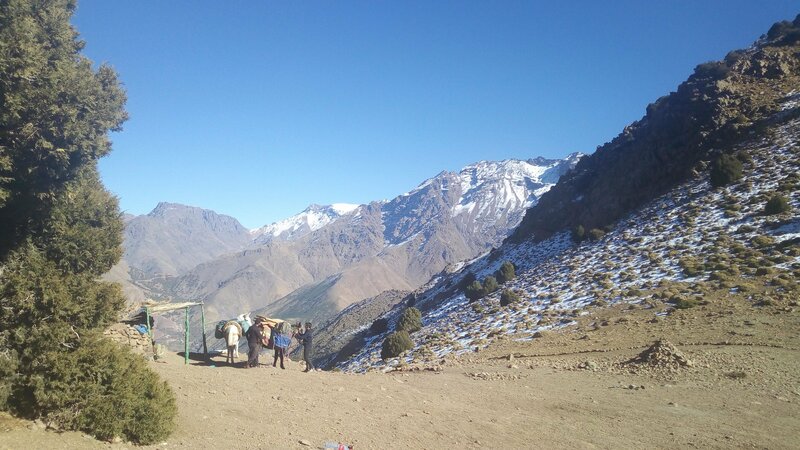 You will reach Mt Toubkal using a route starting from Oukaimeden through the high passes of the Atlas Mountains which will allow you to enjoy spectacular views of the mountains, the Marrakech plain and the Berber villages scattered below. 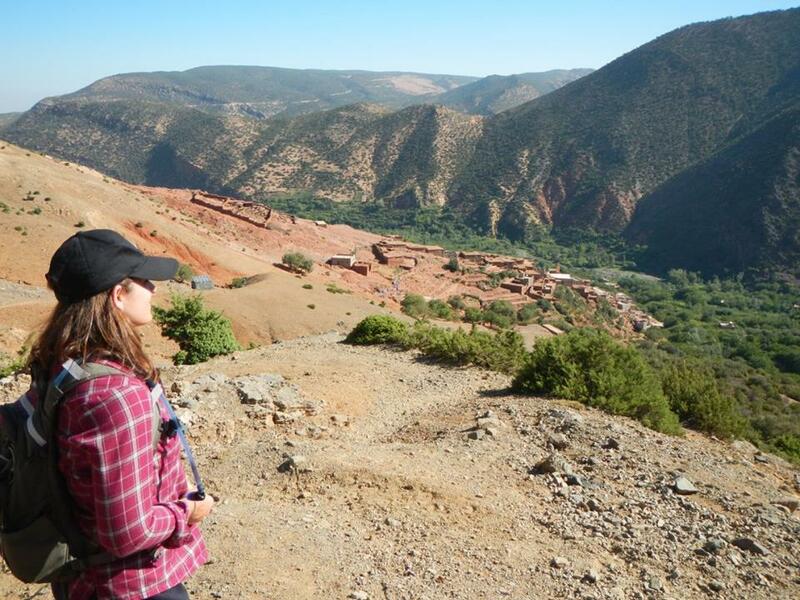 Experience the beauty of Berber villages and the valleys of the Atlas Mountains in the Toubkal region with varied and picturesque scenery, dramatic passes, non-technical peaks and the guarantee of a cheerful welcome from the Berber people. Spend the nights in comfortable riads, guesthouses and mountain refuges. 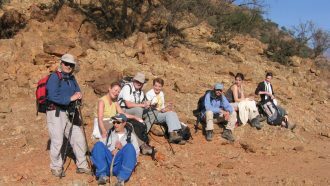 This is a privately guided walking holiday, you will not be part of a group and in the mountains your party will be accompanied by a personal certified guide, a cook and a muleteer as appropriate. Arrive in Marrakech. Private transfer from airport to the hotel. Car transfer to Oukaimeden which is the trek’s starting point, and where you’ll meet your mule team. You will visit some ancient relics, then walk towards Tacheddirt passing by Tizi Nadi to arrive at the valley. Overnight in a lodge or tents. Have a tea inside a Berber house in the late afternoon. 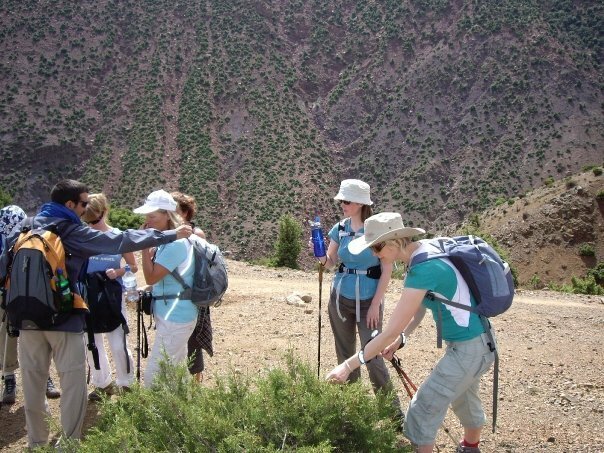 After breakfast, you start your trek from Tacheddirt and head towards Tizi n’Tamatert pass. You will descend to Imlil valley, then to Targa Imoula. 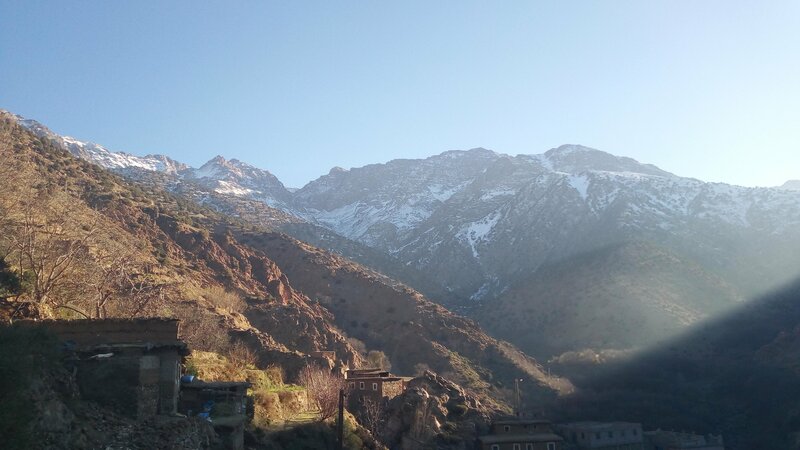 Today you will have the chance to spot Toubkal peak in the background of Ait Mizane Valley) where you will spend the night in a riad. 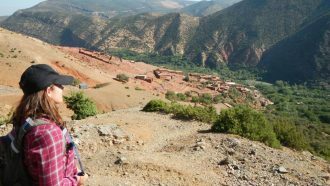 This is an 8-hour trek west of Imlil past Berber hamlets with a stunning mountain panorama including the Oukaïmeden, Tasskssout, Imsserdan, Azzaden valley. The walk features a waterfall where a swim may be possible, juniper and pine forests. 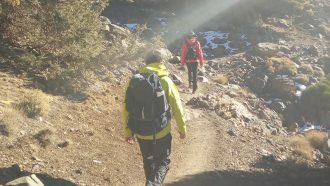 The trail then heads west from Imlil (1,740m) up through almond, walnut and apple groves offering a panoramic vista of the beautiful valley and Berber hamlets of Tanghourt, Fimlil and M’Zik. 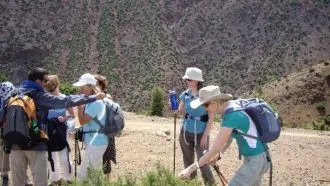 There is a strenuous ascent through the Tizi M’Zik pass (2,664m) from where there is a splendid view of the Jbel Oukaïmeden range, the plateau of Tazaghârt and the pretty Assif Aït n’Ouissedene lined with palm trees. Next, the path descends through juniper and pine woods between Jbel Tasghimout (2,664m) and Adrar Adj (3,729m) to the Tamsoult Cascade (2,204m), a lovely spot for a picnic lunch and a nice place to bathe. The return leg is via the same general route but via different paths via the Tizi M’Zik pass back to Imlil. 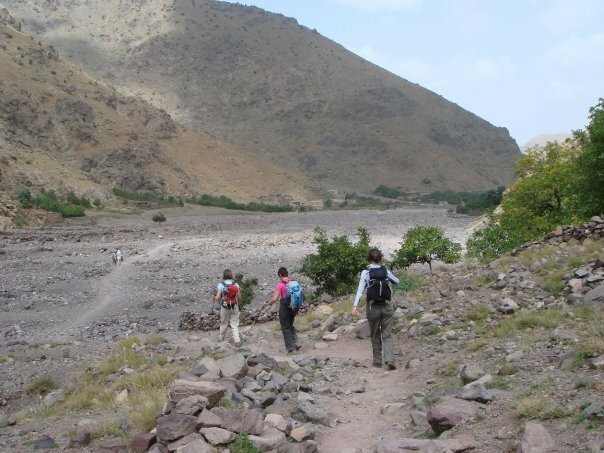 At the village of Imlil, you will leave the vehicle and, in the company of your mountain guide, begin your trek, heading along the Mizane Valley, first towards the village of Aremd and then onto the shrine of Sidi Chamarouch. Built on a moraine spur overlooking the valley floor, Aremd is the largest village in the valley and provides an exciting mix of traditional terraced farming and streets that seem to be permanently gridlocked by goats and cattle. Continuing east and crossing the floodplain your route takes you along mule tracks and up into the high rocky cliffs above the valley. Crossing the river you eventually come to the pastoral shrine of Sidi Chamarouch, which attracts tourists and pilgrims alike (although only Muslims are allowed to cross the stone bridge to visit the shrine itself). From here the trail continues to ascend steadily, snaking and zigzagging its way up to the snowline and the Mouflons Toubkal Refuge (3,207m), your stop for the night. Early in the morning, you will make your attempt on the summit of Jebel Toubkal, the highest peak in Northern Africa. The route takes you up the south cirque, crossing the stream above the refuge and then heading across one of the numerous scree fields, where you will have to negotiate a seemingly endless carpet of boulders and rocks. The walking is relatively straightforward, but the scree and the altitude will make it difficult, however, the views along the way make the walk more than worthwhile. Cresting the ridgeline, you will reach the plateau, from where it is a short walk to the summit and the vistas are quite breathtaking. 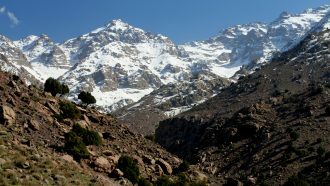 From the peak there are unrestricted views in every direction, from the Marrakesh Plain to the High Atlas in the north and as far south as the Anti-Atlas and the Sahara. Retracing your steps you then return down the mountain and head back towards Imlil, before your transfer back to Marrakech. Departure after breakfast or extend your stay. Vibrant Marrakech is a fascinating city, home to numerous mosques, palaces and gardens. The medina is a densely packed, walled medieval city dating to the Berber Empire, with mazelike alleys where thriving souks (marketplaces) sell traditional textiles, pottery and jewellery. A symbol of the city, and visible for miles, is the Moorish minaret of 12th-century Koutoubia Mosque. 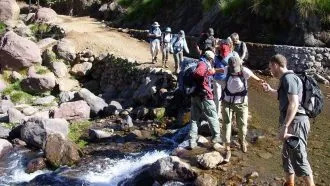 Accommodation is in quality hotels (riads) in Marrakech, hand-picked riads or guesthouses, and mountain refuges on Day 2 and on Day 5 at Mt Toubkal base camp. 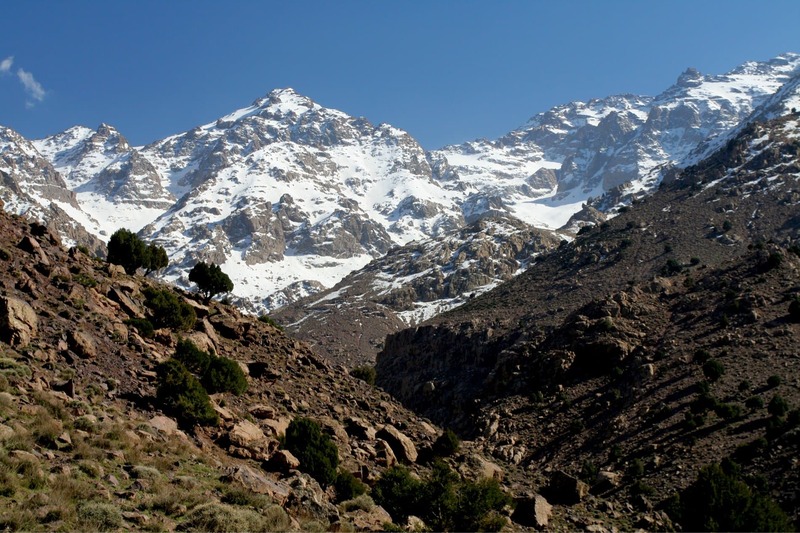 The Toubkal refuge Les Mouflons is located at 3,207 meters height. Its 600 m² area allows it to offer single and family rooms with separate showers, as well as seven dormitories. We will try to accommodate you there in a private room with en-suite facilities, but this depends on availability and cannot be guaranteed. Optional upgrade of the Marrakech hotels is possible (please choose when booking). All breakfasts are included, as well as all lunches and dinners in the mountains (picnic lunches are included when out on walks). 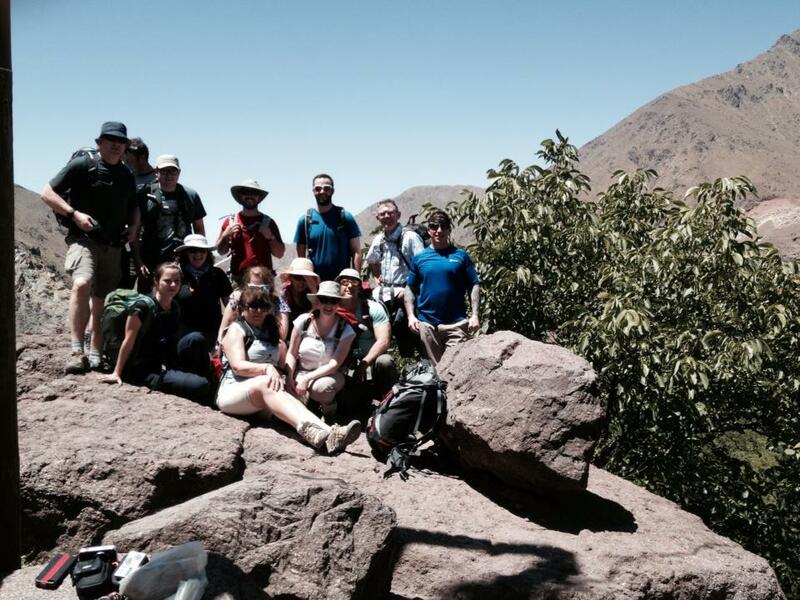 During your mountain walks, you will be accompanied by a local guide, a cook and a muleteer. Marrakech Menara Airport is served by numerous airlines from the UK, European and international destinations. Private transfer from the airport to your hotel on Day 1 and from the hotel to the airport on Day 8 is included in arrangements. Please note that only one airport transfer is included, though we can arrange additional transfers. It is advisable therefore that all party members arrive on the same flight or at least at a similar time. Night transfer extra charges may be applicable on private transfers in case of late night arrivals. During the tour, your luggage is transferred to your following night’s accommodation either by car or by a muleteer. Morocco is considered safe. For up to date travel advice and country info, please check here. 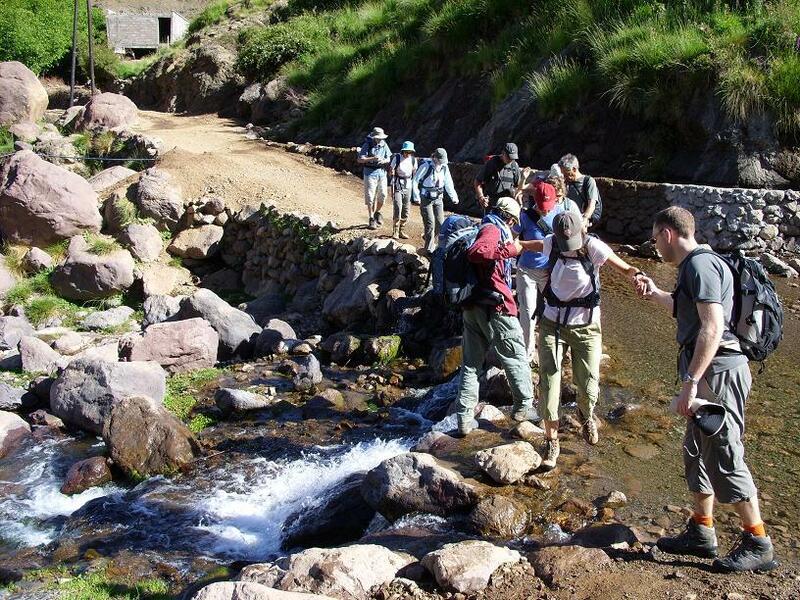 This trip requires an excellent physical condition and some trekking experience. No mountaineering or climbing experience required. 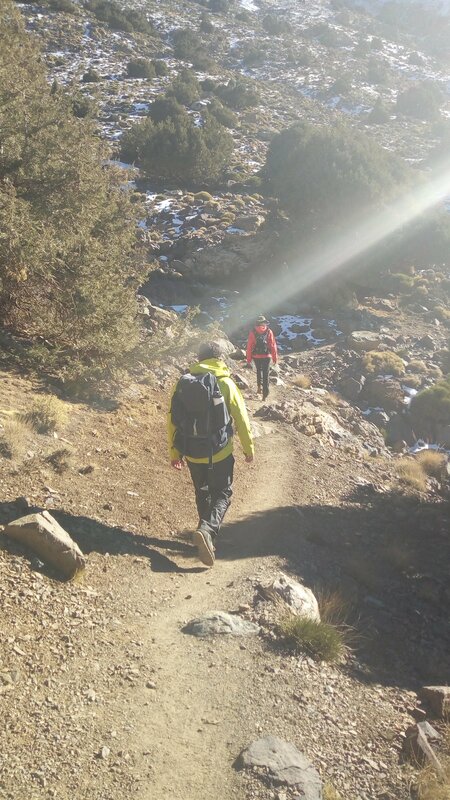 There are some longer (strenuous) walks on Days 4 and 6, especially the climb to Mt Toubkal, which is non-technical but demanding. The terrain varies, and the trails are often exposed to the sun. 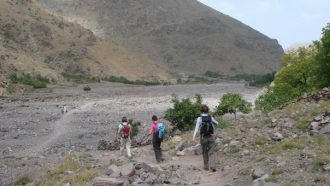 In the mountains, the route follows ancient Berber tracks, which can be high, steep, narrow, uneven and rough underfoot (read more about difficulty grades). Part of the walks are above the snow line. We will provide crampons if needed, which might be the case if doing the trip in winter months. Due to the lack of signposted trails, you will be supported by a local qualified mountain guide. This is a very remote area. You should be a regular walker and have a good level of walking fitness to get the most from this walk. This trip is available to start on any date between 6th of January and 20th of December. July is the hottest month in the Atlas Mountains with an average temperature of 29°C (84°F) and the coldest is January at 13°C (55°F) with the most daily sunshine hours at 11 in July. Some walks are above the snow line year-round. The flexibility of self-guided holidays means that there are no fixed dates and you can start your trip on any date in the season – so please indicate desired starting date when booking. Please note that during the festival times of Ramadan and Eid Al Adha many restaurants and shops will be closed and this may affect your trip experience. The dates for Ramadan and Eid Al Fitr change on a yearly basis. In 2018, Ramadan is from 15th of May until the 14th of June. End of Ramadan Eid al-Fitr 2018 will begin on the evening of Thursday, June 14th and ends on the night of Friday, June 15th. Eid Al Adha (Festival of Sacrifice of Sheep) is from the 21st until the 25th of August. In 2019, Ramadan is from 5th of May until the 4th of June. End of Ramadan Eid al-Fitr 2019 will begin on the evening of June 4th and ends on the night of June 5th. Eid Al Adha is from the 11th until the 15th of August. 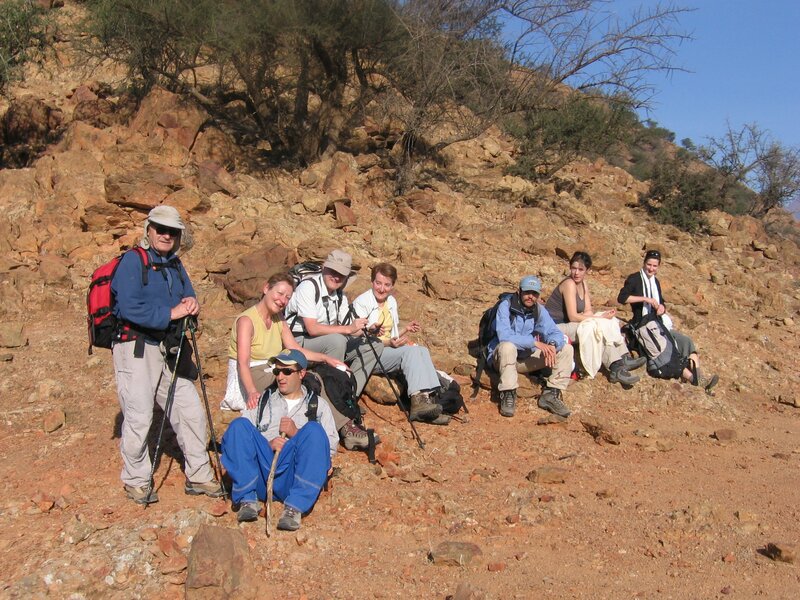 Having the correct personal equipment will make your walking holiday more enjoyable and comfortable. We hope that you find the following suggestions useful when considering what to take on your trip. They are based on personal experiences, and we are confident that you may find other solutions working equally well. We recommend that you travel as light as possible – airlines might charge you an extra fee, and during ground transfers, the place might be limited (and please note that on some days your luggage is carried by a mule!). Ideally, you should bring one piece of luggage weighing not more than 20 kg (to be checked in) and a daily pack (15 – 20 l rucksack) for your everyday essentials (snacks, drinking water, camera, etc.). Below is a non-exclusive list of what you should bring to this trip. More detailed info will be included in your holiday information pack. If you need further advice, please contact a reputable outdoor retailer or us. Good hiking boots (not shoes! ), which can fit crampons (obligatory if you are doing the trip between December and March! Note: if doing the trip in winter months, you may need crampons and a snow axe; these will be provided by our guide locally. Where individual members of a group require a single room, a single room supplement is applicable. Please note that in mountain refuges single room accommodation cannot be guaranteed. Optional “In Style” hotel upgrade: if you prefer to stay on Days 1 and 6 in a luxury 4-star hotel (riad), e.g. Charme d’Orient (or similar) rather than at Riad Zanzibar (or similar), you can add this option when completing the online booking form. Any items not explicitly mentioned in the program. Ourika Valley, due to its many waterfalls and several attractions, is a very popular Ourika day trip from Marrakech. This valley is the sole location within the High Atlas Range where the endangered primate Barbary macaque, Macaca sylvanus is known to occur; this primate is found in the Middle Atlas and a few disjunctive populations in Algeria and Gibraltar. The region is inhabited by Berber people who practice a traditional way of life. You can picnic in the oasis or hike up to the famous seven waterfalls. It is an easy hike, accompanied by an official guide, and it can take between 1 and 3 hours. Note: Overnight accommodation not included, please choose an extra night in Marrakech extension when booking. Stroll in the Medina of Essaouira, which can be explored easily as the streets are aligned opposite to every other Medina streets in Morocco, which look like a maze. Note: Overnight accommodation not included, please choose an “Extra night in Marrakech” extension when booking the guided tours.